Pattern Review are offering 2 PDF patterns from their Pattern Review Exclusive range, which includes – you guessed it – the ‘Claire’ Wrap Dress! (They are also offering a very generous 30% automatic discount on the Claire if you fancy making it for the Challenge valid from 27th April through to 4th May – no code needed). Ana from CocoWawa Crafts is offering a paper copy of her Marshmellow dress pattern plus as many of her women’s and girls PDF pattern range as the winner desires! Minerva Crafts are offering £100 worth of specially curated fabric from their huge selection – the winner gets to choose their preferred colour palette and Minerva Crafts will curate your fabric gift around that! Crafty Sew & Sohaberdashery and fabric storeare offering 2 pdf Patterns to one winner from their stocked range of indie sewing patterns. By Hand London are offering 3 pdf patterns to one person from their stunning collection plus a 20% discount on the Orsola Wrap Dress with Code: SEWTOGETHER at checkout until 11/04/18! Sew Over It are curating and supplying 3 separate pattern bundles for 3 winners! You may want to check out their collection of wrap dresses including their Ultimate Wrap Dress, the Eve and the 1940s wrap dress. Sew Essential, the haberdashery and fabric store, are gifting a pack of 18 Mettler Threads to one lucky recipient! Helen’s Closet is kindly offering any two PDF patterns to one Giftee from her eminently wearable collection; pictured here are the Suki Kimono, the Winslow Culottes and the Avery Leggings! Blackbird Fabrics are generously offering $100CAD worth of specially curated fabrics to one lucky sewist! (Did you know they ship worldwide?! Carolines’ listings are awesome with really detailed information which just makes browsing her store a joy! Girl Charlee UK & Europe are offering £50value Fabric Bundle to one person plus a generous 15% off their entire fabric range with code : ST4S15 at checkout! Love Sewing, the monthly magazine, will ship a bundle of the Big 4 Patterns to one participant, including Patterns from McCalls, Butterick, Kwik Sew and Vogue! The Foldline – Exciting things are in development over at our favourite Sewing Community Hub so for now we’re only able to tantalise/torment you with “…details to follow…” so keeping their backing ‘under wraps’ until their big reveal! Sewhouse 7 are adding two gifts to the pot; 2 pdf Patterns and 2 paper patterns; pictured here are their Burnside Bibs, Toaster sweatshirt and Teahouse Dress. Sewisfaction are offering a £30 voucher to spend across their entire range of fabrics and stocked patterns from a range of independent sewing pattern companies. Or if you’re lucky enough to be in the vicinity you could always visit them at their studio in Wokingham, Berkshire! Cotton Reel Studios are also offering a £30 voucher to spend across their online range of dressmaking and lingerie fabrics, patterns and kits! Muse Patterns are offering one lucky stitcher 2 of their PDF patterns plus a 20% discount on their Gillian wrap dress – pictured bottom right – for everyone with code SEWTOGETHER until 11/04/18! Named are very kindly offering 2 pdf patterns to one giftee as well as a 20% discount for all #sewtogetherforsummer makers on their beautiful Kielo and Olivia wrap dresses! Use code : SEWTOGETHER at checkout before 04/04/18! Cashmerette a PDF of one winners choice from their collection; I’ve just sewn up their Appleton wrap dress and I’m in love – finally, a wrap dress that actually fits my chest! Fabric Godmother Josie will kindly send one giftee any paper pattern from her extensive Indie range; whilst your on her website you might as well check out her beautiful stock of ex-designer and fashion fabrics too! 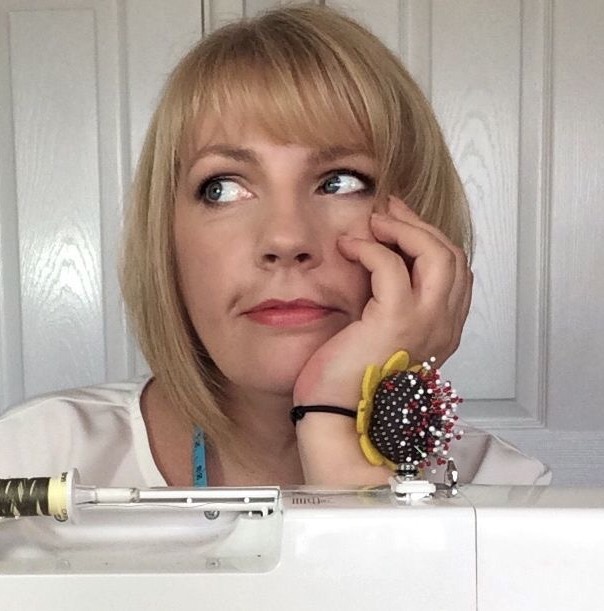 Sew Hayley Jane Will send one #sewtogetherforsummer sewist an especially curated ‘Super Stash Box’ full of sewing goodness…if you can’t hold out for the chance of getting your hands on that, you might want to consider subscribing to her monthly sewing box subscription service! Wendy Ward, best selling author of the Beginners Guide to Sewing with Knitted Fabrics, is offering 3 PDF patterns from her dress collection to one winner! Lara Sanner is gifting 4 pdf patterns to one lucky person. And how gorgeous are these patterns; I’m so tempted to get their Truffle Coat for myself and the mini version for my girl. Pier & Palace patterns are giving away 3 pattern bundles; that’s 3 lucky peeps! Pink Coat Club is an Etsy store, stocking these cute pins, amongst others. I proudly wear the one Monika gifted to me – they’re offering 3 pins to one giftee! Sew Me Something, who, as well as designing their own Patterns, stock haberdashery and fabrics, run sewing workshops and retreats, are gifting two of their patterns to one winner (paper if UK based, otherwise PDF). And there we have it! How’s your wrap dress plans coming along!? Wow, fab prizes. I cut out & started sewing my dress yesterday & will hopefully finish it today. I made a couple of Shirtdresses last year but never got round to taking photos, but will definitely join in this year. Such awesome prizes! I look forward to entering! Woah!!!!!! What an incredible selection Sarah. You, Mon and Suzy outdid yourselves. Bravo!! !